Insect stings (bees, wasps, yellow jackets, hornets, and fire ants) can lead to life-threatening allergic reactions. 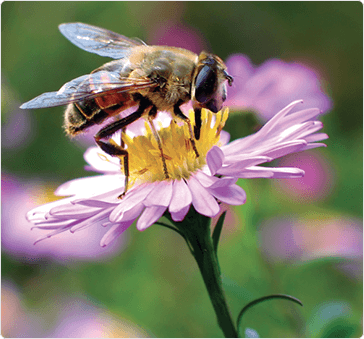 If you have had an allergic reaction to an insect sting in the past, you have an approximately 60 percent chance of a similar or more serious reaction when you are stung again. We can prevent this. If you or someone around you is experiencing these symptoms, seek emergency care immediately. Allergic reactions can occur within minutes of a sting and can result in unconsciousness in 10 minutes or less. Acute allergic reactions to insect stings are reversed by treatment with a drug called epinephrine. If you have had such a reaction in the past, you may be instructed to keep epinephrine with you at all times so you can self-inject this medication if you are stung. Our board-certified allergist/immunologists can treat you to prevent future reactions to insect stings. Venom immunotherapy involves administering gradually increasing doses of venom that caused your reaction. Such treatment gives almost 100% protection against subsequent reactions, and if a reaction does occur, it is usually mild and not life-threatening. If you have had such a reaction, our board-certified allergists can determine if you are a candidate for venom immunotherapy (stinging insect allergy shots). Don’t take chances. Call (813) 971-9743 today for an appointment or use our online form to request an appointment at one our five Tampa area locations.